Many internet users are operating online, and millions of people full time online working and trillions of dollars are earned and spend through the internet world wind. 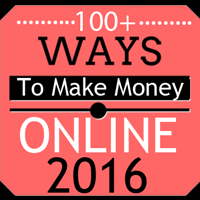 So now i am telling to you 100 + ways, you can make money online. you can visit all of the below networks websites, and there will be an option to join as a Publisher easily. and make money online at home. Best and 1st way to make money online, Through Google Adsense, networks you will earn money with clicks and impressions. you just create a blog or website and start displaying Google ads, and make money online. BuySellAds are ads selling website & you can use on your website or blog. This network is co patners Yahoo & Bing, you can make good money to using media.net. This is a "CPM" network which will pay you for valid clicks, and impressions on your website. You can earn from your blog or website by displaying Infolinks advertisment. You can start making money out of your Wbsite. Bidvertiser is free to use and easy to implement. Getting ads on "Chitika" displaying on your website or blog, for make money online. Other Ads networks with respect to this article. Now visit below websites and look, which jobs or online opportunities they offer for you to make money online easily. You can simply showcase your skills and catch customers to your product and services. Fiverr starts from $5 or up with thousands of $$$. You can money on upwork.com easily by creating an account which is free. Upwork has more than 6 Million Users offer jobs and work online. Freelance work is freelancer.com, this network online work in different things, offers, web development and much more. If you are a designer or developer then you can find many work on 99design.com. Others freelancing platforms with respect to this article. you can easy become a teacher on below websites by creating a free account and start teaching online. YouTube is very easy to use, just start creating video tutorials on any topic, and display Google advertisement ads to earn handsome money online. Others teaching networks with respect to this article. just visit the below websites to find the affiliate option, sign up for an affiliate account and start making money online with your site,s by promoting the affiliate programs. Large network of online shopping and physical products is amazon.com, You can become an affiliate there to promote many brands products which are useful for everyone worldwide. Ebay, get the opportunity to be a publisher of eBay and start promoting the products, and make money online. More Affiliate Networks with respect to this article. Below sites are for bloggers, who want to get sponsored reviews and publish on their blog. Blogger.com is a free blogging platform (CMS) which you can use to create your free blog just a few minutes. and start making money online by displaying advertisment and affiliate marketing. Others blogging platform with respect to this article. You can easily sell your videos on YouTube with paid subscription. you can sell your videos by making them paid dailymotion network. Sell your videos on Vimeo by making them protected. this website for selling photos, videos and much more you make money on this site in different ways. upload video and earn money by uploading videos, photos & music etc. Note: are you already making money online? or thinking to start making money online at home? you can share your experience below in the comments. i am 24/7 available to touch with you. If so, did you take a look at Propeller Ads? Did you know that you can generate cash by locking special pages of your blog / website? If you're looking for a solid contextual ad company, I recommend you take a look at Chitika.